Varicella Zoster Virus (VZV) or chickenpox, as it is more commonly known is an extremely infectious illness. Fortunately, most people in the UK will have had this infection in childhood when it is at its mildest. If you have had chickenpox as a child, you cannot catch it again because your body produces anti-bodies which makes you immune. After you have had chickenpox, the virus remains dormant in your body and can become active again, although it then causes shingles which can become very painful, but thankfully, not as contagious. If chickenpox is contracted during adulthood it can cause serious illness which can become life threatening if pregnant. Therefore it is extremely important that you inform your GP if you suspect that you have been in contact with someone suffering from chickenpox when pregnant, especially if you are unsure if you have had the illness as a child or you are in your third trimester. If you find out during your pregnancy that you aren't immune you may be offered the vaccination after the birth of your baby. Therefore simply put - if you know you have had chickenpox in the past and you come into contact with someone who has chickenpox during your pregnancy, you will be immune and need not do anything. If you come into contact during your pregnancy and unsure if you have had chickenpox previously, you should contact your GP who will perform a blood test to clarify. If it is found that you are not immune and have come into contact, you will be offered an injection of Varicella Zoster Immune Globulin (VZIG). This will strengthen the immune system and can make the infection milder if you do go on to develop chickenpox. This injection needs to be given within 10 days after coming into contact with the infected person. If you develop a rash during pregnancy, it is important that you contact your midwife or GP. So how easy is it to contact chickenpox? Unfortunately - you can catch it very easily if you are non-immune. If you are in close contact with a contagious person either face to face for 5 minutes or in the same room for at least 15 minutes then you may come contract the illness and remember you may not always know that a person is contagious as the rash does not appear immediately. So what can happen to my baby if I contract chickenpox during my pregnancy? This depends on what trimester of pregnancy you are in. If you are under 28 weeks pregnant, 1 to 2 % of babies may develop damage to the limbs, eyes. bladder or bowel. Your GP may want to perform an ultrasound scan and offer other tests such as an amniocentesis. If you are over 28 weeks but below 36 weeks the virus will remain within the baby's body but will not cause any symptoms, although the virus may become active causing shingles. From 36 weeks to birth the baby may become infected and can be born with the infection. 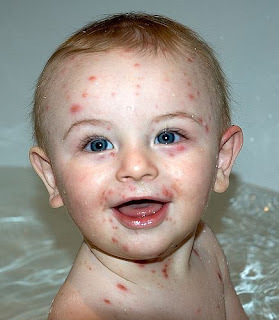 If your baby is born within a week if your chickenpox rash becoming apparent, the baby could get sever chickenpox and will need to be treated with the VZIG immunoglobulin.. If you catch chickenpox within a week of you baby's birth your baby may again get the illness and will need treating. Your baby's well being should be observed for a month after you become infected. This will include an eye test and a blood test to check immunity. If your newborn baby comes into contact with chickenpox in the first week post delivery, eg from a sibling, and you are immune then there is nothing to worry about as the baby will be protected by the immunity from you that crosses the placenta. If you are not immune, then again the baby may be treated. If you are immune to chickenpox and come into contact with someone suffering from shingles, you should not worry. If you are not immune it's important to note that the risk of contracting chickenpox is very low but you should seek advice from your midwife or GP. Remember, you can safely breastfeed even if you have chickenpox or have had the illness during your pregnancy. I will be available for online midwifery advice chats most evenings from 8pm (GMT) so click on the icon on the home page to access the web chat and 'Ask the Midwife'. there should be wide-spread info about this thing too. I really hated the fact that most of the articles on pregnancy and chicken pox usually say in first 2-3 paras that you dont really need to fear since most of adults had it as children. The thing is someone is searching about it then surely they've come in contact and they are not immune. I caught it in 17 weeks time ... unfortunately the lady i was visiting little thought of notifying me this simple fact that her house is contagious so dont come. In schools and for parents, similarly at GP surgeries this should be taught that c pox is highly contagious so at least warn people and children around you so that they can keep distance. It can have severe effects for some. BTW shingles is the same virus so if you are not immune to c pox you can easily catch it from someone with shingles as well.